Agriculture/farming was the driving economic force in Harvey County from the beginning. Much was centered around grain crops, especially wheat. From the farmer to the miller, wheat production was a cornerstone so it should be no surprise that many early businesses focused on agriculture. Several of them serve as examples of ingenuity meeting a need and creating a success story. 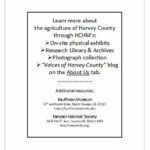 Through on-line exhibits, this slideshow series gives short stories about Harvey County and its cities; and provides a sampling of the stories which can be discovered by viewing the on-site exhibits at HCHM, by examining source material in the Research Library and by utilizing the HCHM photo collection. 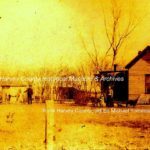 The HCHM blog, “Voices of Harvey County” on the About Us tab. Harvey County Harvest. Learn more about the harvesting process here. From dairy operations to mayor—Daisy Dean Spencer. Learn more about Daisy Spencer here. 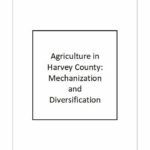 Click anywhere on the first image below to scroll through Slideshow 6–Agriculture in Harvey County: Mechanization and Diversification. Mechanization Was Developed and Advanced. Most farmers wanted to grow crops they could sell. For many years, the standard farm size was 160 acres—too large for farms that provided all their needs, but not quite large enough for commercial ventures. However, farming became big business in Kansas due to a growth in the size of farms, ever increasing crop yields through the development of hybrids, and technological advancements. 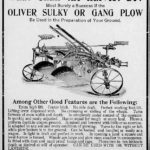 Businesses Developed Around Farm Machinery. Technology allowed for a transition from the labor-intensive aspect of farming to ever increasing mechanization. This conversion created business opportunities in Harvey County—that of continual improvements, inventions, manufacturing and sales of farm machinery. Over the years, entrepreneurs have been instrumental in Harvey County becoming a key player in the agricultural industry. 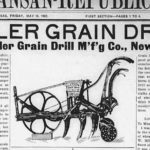 A small sampling includes the Prairie Queen, Miller Grain Drill, W.J. Trousdale and Hesston Corporation businesses. William Trousdale, company president, led the Prairie Queen Mfg. Co. into prominence. The former Newton Carriage Works building (located at W. First St and Ash St, the 2018 site of a metal recycling firm) was acquired. In 1903, the stone facility was re-purposed for the manufacturing and sales of the Prairie Queen separator and the Baker Engine. The Prairie Queen separator (a threshing machine powered by a large steam engine) separated straw from wheat and chaff, and then cleaned the grain. An entry of the equipment at the Kansas State Fair in Hutchinson won an award and accolades. 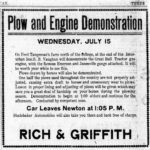 The business was successful enough that both Hutchinson and Wichita tried to lure the company away from Newton. 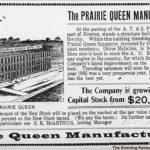 Miller Grain Drill Company – A Contemporary of the Prairie Queen. W.W. Miller (president), J.A. Randall (vice president) and C.M. Glover (secretary and treasurer) organized the Miller Grain Drill Company in 1902. The plant was located “in the old foundry building” on East Third street, Newton. Their implement was used to sow wheat. In 1904, the company received exclusive rights to manufacture the Coble hay stacker and power device. The machines were labor saving in the handling of alfalfa and hay. An additional enterprise was launched in 1904 under the name of W.J. Trousdale and Company. Trousdale utilized the manufacturing capabilities of both the Prairie Queen and Miller Grain Drill plants in producing the “Jayhawker Crusher.” The invention was attached to a windmill which provided the power needed to crush corn or Kaffir corn for rough feed for livestock. Hesston Manufacturing Co. (“round tops” in center front of photo). 1953 photo. Stemming from the belief “There can be a better way!,” Lyle Yost, Adin Holdeman and Elmer Berner founded the farm equipment company Hesston Manufacturing Co. in 1947. Between then and the mid-1970s, the company grew from five employees in Hesston to over 3,000 worldwide. Employees drove from all parts of Harvey County as well as from Sedgwick, Reno, McPherson, Marion and Butler counties. 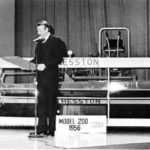 The name was changed to Hesston Corporation in 1966 and has continued to have an evolution of names. In the mid 1970s, Fiat Trattori became the owner. In the latter 1980s, a new subsidiary was formed and merged with Case IH to form Hay and Forage Industries. Known today as Agco Corporation, the business continues to be a major manufacturer of farm implements and is the largest employer in Harvey County. Photo: “Hesston, Kansas: 1886-1986.” Murray C. Bandy. 1988. Innovation Continues. Birthed in Harvey County, Agco (known for years as “The Corp) has been blessed with an abundance of local talent. In the photo, Lyle E. Yost (right) presents a plaque to Allen White, engineer and inventor, in recognition of 41 patents assigned to Hesston Corporation. Behind the men is a swather, one of the first types to be produced. Note the price of $2,200 in 1956 would be just over $20,200 in 2018 dollars. Photo: “Hesston Centennial, 1886-1986.” Murray Bandy. 1988. Dairies in Harvey County. While it’s true the raising and harvesting of crops has been very prominent in Harvey County’s agriculture, dairy farms have been a key element. They provided diversification for the county’s economy. Hershberger Dairy, located south of Zimmerdale, operated from 1929 to 1954. It developed a registered and well known Guernsey line of dairy cattle. Zarnowski Dairy, in northwest Newton, started in 1918. Over a 40 year span, the family developed a nationally outstanding herd of Holstein dairy cattle. Lottie Gradert and Phillip Peter Sauerwein established a dairy in the late 1870s on a farm west of Walton. 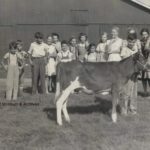 In 1941, their grandsons took over the dairy herd of about 18 and enlarged it to 225 cows and heifers. Notable in the North Newton area were College Hill Holstein Dairy Farm of P.W. Enns, High View Farm of Mrs. Daniel G. Koppes and Tangeman Dairy of Fred Tangeman. On the south side of Newton was the Spencer Dairy. Photo: HCHM Collection. Plucked from the collection of Harvey County Extension office documents and photos of the 1920s and 1930s which are housed at HCHM, this photo shows the Hesston Union Champions 4-H club listening to a demonstration at the Hershberger dairy. P.W. Enns and College Hill Holstein Dairy Farm. 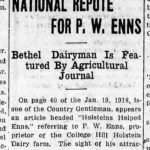 In 1918, Enns gained national recognition for his dairy. The Country Gentleman noted, “P.W. Enns of Harvey County Kansas is the boss dairyman of Kansas. At least that is what the public press proclaimed him when he was elected president of the Kansas Dairy association. Mr. Enns also is director of the Harvey County Farm bureau, president of the Farmers’ Institute, dairyman, Holstein breeder and a booster for Kansas and America in general.” Mr. Enns gave this explanation of why he changed from general farming to dairying: “I lived in Oklahoma when butter sold at 4 cents a pound, eggs at 3½ cents a dozen; and mighty few purchasers of this farm produce even at those figures. I had five cows, a few hens, lots of courage and the ambition to succeed in farming. I weathered the period of low prices and hard times when the majority of my neighbors who were grain farming failed, mainly because I stuck to my cows.” Milk from College Hill dairy went to supply a local hospital, a local restaurant, and Bethel College. Source: The Evening Kansan Republican. Tuesday, Jan 29, 1918. The Koppes Dairy – High View Farm. 1890s – 1960s. The Daniel G. and Catherine Koppes family moved from Ohio to Kansas in 1881. Daniel was a cabinet maker, carriage painter and businessman. The Koppes family bought 160 acres west of present-day North Newton. The home, originally two and a half stories, was built in 1883. In 1935, the top story was removed and altered to its present appearance. 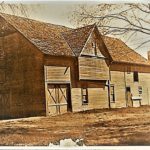 Before the automobile, the Koppes farm became a natural stopping point for travelers. People from Moundridge coming to Newton would often stop here for dinner or to rest their horses. The Bethel College board also met in the Koppes home on occasion. 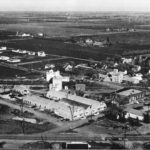 In the late 1890s, the Koppes dairy farm was established with milk and cream being sold directly to the public as well as to such area creameries as the Fred Harvey Co., the Zimmerdale Creamery Co. and the DeCourse Creamery Co. The Koppes family closed the dairy in the mid-1960s. Undated photo: Collection of Ronald Dietzel. Tangeman Dairy. Closed 1964. Established by Fred Tangeman, the dairy was located just outside Newton. It provided products to the Fred Harvey Company for several years. In 1928, Fred sold the dairy and farm to nephew Clarence and his wife Bertha. In November 1938, Clarence began retail sales. Customers would drive to the Tangeman dairy to buy their milk. The dairy was closed in July 1964. Clarence continued farming. Source: Evening Kansan Republican. July 13, 1914. Daisy Dean Bruce Spencer – Owner and Operator of Spencer Dairy. 1922 – 1950. Daisy and her husband John Oliver Spencer purchased a dairy on the south side of Newton in 1922. When he died in 1932, Daisy and her children ran the dairy until it was sold in 1950. In addition to her work with the dairy, Daisy was very active in community affairs. 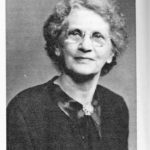 She was elected to the Newton City Commission from 1945 until 1949 and served as the first woman mayor of Newton from 1945 to 1947. Daisy was a charter member of the Golden Circle Farm Bureau Club. Spencer Road, on the east side of Newton, was named in her honor. 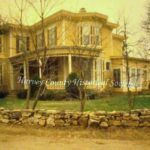 Photo: Harvey County History. Linda C. Smurr, Project Director. More Diversification – Cattle, Horses, Hogs, Sheep, Fruit Orchards, Chickens. Added into the agricultural mix were farmers who had beef cattle, horses, hogs, sheep or fruit orchards. On numerous farms, the wives and children did their part to make ends meet by raising and tending chickens as both a source of income and a source of food through the consumption of the eggs and meat. “Egg money,” acquired by selling eggs to the city folk, was often the solution for farm families to meet various expenses. Photo: HCHM collection. Farms Gained “Romance and Beauty” Through Their Name. Prior to World War I and at various locales in the nation, there was a movement of giving names to farms. This trend was intended to give the family a greater interest in the farm. Through a pleasing name, it was thought the “romance and beauty” would give inspiration to improving lawns, orchards and gardens as well as keeping fences in good repair and buildings painted. Farm names were to be kept in the public eye by using white washed stones or lettering in flower beds. Proponents advised an individuality to the name by using natural features, characteristics and type of farming, the family name, or an historical name. In Kansas, the payment of a one dollar fee to the county clerk made it possible to register a farm’s name which protected it from being duplicated. This practice was promoted as a way to advertise the products of the farm. Undated photo of unknown Harvey County farm on W. 12th road. HCHM Collection. Ambleside Estates, Home of Mr. & Mrs. H.L. Hart – Built in 1878. As an advocate of the naming campaign, Mrs. H.L. Hart christened her country place as “Ambleside” after an estate in England. A newspaper article reported the name was selected because of, “…amble meaning to walk leisurely, and the place is beside the road. And it is a pretty place, and the example of giving it a name is one worthy of general emulation.” The first farm name registered in Harvey County was in 1911. Mrs. H.A. Hunter of Highland Twp wanted her place to be known as “Sunnyside Farm.” On the same day, J.W. Nolder of Macon Twp registered his farm as “Pleasant Hill.” By 1917, farm names had been registered in nearly every township of Harvey County. 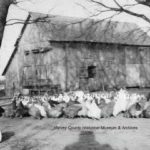 A few examples: J.J. Kellar’s “Kellar Poultry, Dairy & Berry Farm” in Halstead Twp, Mrs. H.L. Hart’s “Ambleside” in Newton Twp, A. Prouty’s “Proutys Grove Farm” in Macon Twp, Wm. J. Rodgers’ “White House View Farm” in Pleasant Twp, and N. Molzen’s “High View Farm” in Highland Twp. Photo from 1989: HCHM Collection.